This post first appeared on Brazen Life, a lifestyle and career blog for ambitious young professionals. See the original. This is an actual picture of the vision board Erik and I created for our house search process. Are you at a crossroads in your career? Perhaps you’re looking for the perfect career for your skill set. Maybe you have an OK job, but it’s not quite what you hoped. Or maybe you’ve finished school and are planning your next move. When change is on the horizon, it’s common to overthink, worry and question everything. The brain takes over: you create pros and cons lists and the agony of the decision can take over your whole life. Luckily, you’ve got another way to work through this situation. It may seem silly, even trivial or new-agey, but creating a vision board can provide clarity, attract your ideal career and save your sanity. 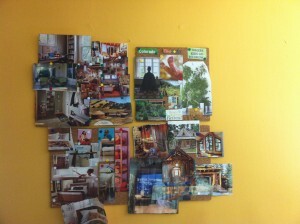 A vision board is a visual representation of what you want to manifest. At the most basic level, creating a vision board can help you see what you’re thinking. It puts visuals to complicated thought processes where words may fail. Oftentimes, the images you choose don’t necessarily make sense, but when put together, they create a representation of your true self. On a deeper level, vision boards help you attract what you want in life. Think of it like asking the universe for what you want. If you don’t know what you want to create or manifest, the universe won’t know, either. The key in manifesting is to know what you want and articulate it. Many of us have a hard time articulating our deepest desires in words, so creating a visual image helps. This process taps into a deep, unconscious part of yourself that knows your ideal career. This part is free from cultural desires or what you think you want or are taught to want. You might be surprised to see the career you want isn’t about money or prestige or that you’re interested in a different industry. Vision boards are useful for many life changes, from finding a mate to buying a house, and can be used for general life purposes, like career or vacation goals. There aren’t any rules except to find a bunch of words, images and visual representations of what you want and put them on a board. Size and your artistic ability don’t matter. Remember that the brain wants to create whatever it’s told. If you constantly tell yourself you’re a failure or don’t deserve a good job, you’ll never achieve what you truly want. What you put on your board needs to transcend these self-defeating thoughts to focus on the positive potential in yourself. Whatever you believe, you become. Find every old magazine in the house that can be cut up, pull out the scissors and glue and have a dedicated piece of cardboard or poster board to use. You could even use cork board and push-pins. Be as creative or simplistic as you’d like. Sit down with your supplies, maybe some nice music, a glass of wine and no distractions. Either do this by yourself, with your partner or have some friends over for a vision board party. This could be as simple as taking a few slow breaths or as complex as a full ritual and meditation session. Don’t try to do anything new, but do what feels appropriate. If you’re trying to find a job or attract your ideal career, repeat “ideal career” or “find a job” to yourself a couple times. By doing this, you set the intention of what you’re doing and remind yourself of your goal. This is big: don’t try to create something or think too much. If you flip a page and an image speaks to you, cut it out. If you see a keyword and it creates some thought or reaction, cut it out. Flip pages and cut and lose yourself in this process. Let go of the desire to analyze or figure anything out. By refraining from thinking about it, you’ll be able to access deeper areas of yourself. Either find a creative way to arrange them or just slap them on. 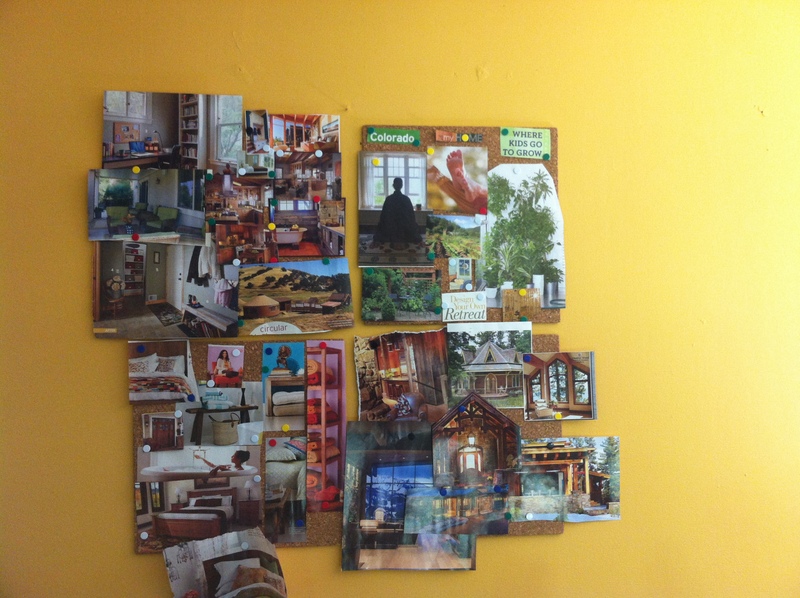 What to do with your completed vision board? When your board is complete, hang it somewhere you’ll see it. Look at your board often, think about it, study the images and keep the intention or goal in mind. Take some time in the morning or before bed to reflect on your deepest dreams, goals or desires. Use all your senses to imagine the end result, like what it feels like to sit in your new office or the happiness you feel when helping people. This may not be a quick process, but by keeping your vision board in a noticeable place, you’ll constantly be sending messages out into the universe that you’re serious about creating this change and you’re ready for that goal to manifest into reality. If you’re truly committed to manifesting this change, the universe will respond. (Click here to tweet this thought.) Stay focused, but be patient. You can create your own reality and attract your dream job. Brazen powers real-time, online events for leading organizations around the world. Our lifestyle and career blog, Brazen Life, offers fun and edgy ideas for ambitious professionals navigating the changing world of work. Triangle pose is a pretty common pose, seen in a variety of class styles, but that doesn’t mean it’s easy. It’s one of those poses that doesn’t seem to complex, but once you start working with the actions, you can see it’s true depth. The problem is this type of detail isn’t often workshopped in classes, but simply glanced over. Take 10 minutes, practice the actions and begin to find new clarity and understanding in your triangle pose. Start standing at the top of your mat. Step your right foot back decently far (we’ll start with the left forward like in the picture). Keep your left foot pointing toward the front of your mat. Turn your right foot about 45 degrees. Check your stance. Does it feel too wide or too short? Adjust it. Engage both legs, hugging the muscles toward the bones and keeping both legs straight (no bent knees and no hyperextended knees). Keep the legs engaged and raise your arms up to shoulder height, palms facing down. Make sure your chest and frontal hip bones are facing straight (not over your front foot but toward the long edge of the mat). Now, don’t rush and let’s start to move. Shift your hips back as far as you can. Think about bringing your right hip toward our right lower ribs. You may feel a stretch in your inner left thigh. Now, start to reach your left hand over your foot – as far as you can go. The goal here is to lengthen both sides of your torso evenly. Stay where you are and let your left hand float down to your skin, the floor or to a block set up inside your left foot. Think about using your core rather than putting all the weight into your hand. Bring your right hand to your hip (just to get that arm out of the way while you finish the legs). Think about drawing your outer left hip toward the back of your mat (it might be a very slight movement). This will intensify the stretch in your left hamstrings (backs of the upper legs). Allow your right frontal hip bone to roll just slightly toward the floor. Now make sure you’re not arching your back and think about growing longer through both sides. Finally, raise your right hand straight up from the shoulder joint (not wrenching on the arm). Attempt to open your chest completely rather than collapsing (it is a twist), stacking one shoulder over the other. Your gaze can either be straight out, down toward the floor or up toward your top hand. Now hold all these actions, but find a way to relax just slightly and feel the stability of the pose. Now, I realize there are a lot of steps here. The first couple times might be challenging, but after a bit of practice, this will come easily and you’ll just remember all this. Let me know if you have any questions or concerns about the actions of this pose or how it makes you feel. Leave anything in the comments and I’ll get right back to you! Now that you’ve done the pose, you might notice where you feel a stretch or muscles working. Do you ever think about the products you put on your body every single day? Most people don’t. I almost typed “women” instead of “people” but this is one big misconception. We think of cosmetics are meaning make-up and specific to women, but they are much more than that. Every single product you use on any part of your body for beautification or cleanliness is a cosmetic. From toothpaste to hair gel to foot scrub, they all count. Most people use 10 or more cosmetics every day, although I’m willing to bet its many more for a lot of people. 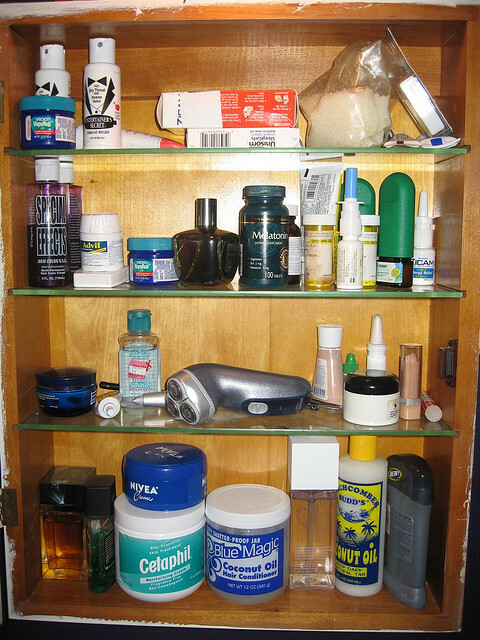 Look in your medicine cabinet, in your bathroom drawers and cabinets. That’s a lot of product, right?! Now did you know that the ingredients that go into these products that sit on your hair or skin or eyelashes aren’t really regulated? It’s true, many products include endocrine disrupters, known cancer-causing agents and products commonly causing rash or other symptoms. No one really oversees this and ingredients don’t have to be considered safe before they can go in something. What makes it more scary is that even if you think you’re buying natural products from trustworthy companies, it’s hard to really know what’s in your products. It’s a scary business and you could be slowly poisoning yourself or putting cancer-causers on your skin (which then absorbs into your bloodstream) on a regular or daily basis. Think lead, formaldehyde, parabens, BPA and arsenic. Now, if this is new info, don’t freak out! You have control over your health and over the products you choose to use. The easiest way to find out the potential harm from your favorite products is the Environmental Working Group’s Skin Deep Database. Go there. Now. Search your go-to products and take in the information. Then, you don’t have to change. It’s your choice, but knowledge allows you to make an informed, conscious decision about how you choose to live your life. If you’re interested in learning more about this topic, the cosmetics industry and how it affects your health, check out this article I wrote for Boulder Magazine. Finally, I’m interested in your thoughts on this topic. No judgement – just curiosity. Do you use a lot of cosmetics? Does the lack of regulation and potentially harmful ingredients scare you? If you checked out the database, what did you learn? Will you change your products or are you happy with what you use? It’s hard to deny that the sun is pretty powerful. It gives us tons of light, it helps plants grow and without it, we wouldn’t survive. Yeah, it’s that important. We often talk about the harm the sun can do – like sunburns and skin cancer – but we fail to talk about the good it does for our health. Here are a few of the health benefits of sunshine – the first obviously being vitamin D.
Disclaimer: While your doctor and dermatologist would never suggest going outside without protection, I advocate for 15 minutes of unprotected sunshine per day. The reason for this is because sunscreens, especially the strong ones (full of chemicals by the way), are designed to protect your skin from the sun’s rays. But to get the maximum benefit of the sun, we need at least a little time where we can fully absorb their benefits. Keep it short and if you’re out more than 10-15 minutes, then put on a hat, long-sleeves or chemical-free sunscreens. 1. Vitamin D: This simple little (necessary) vitamin has become common knowledge over the past couple years. Everyone’s talking about it and for good reason. Many of us, especially those living in areas with minimal winter sunshine, are deficient. (A simple blood test at your doctor’s office can determine if you’re deficient). What happens is the body absorbs sunlight and turns it into vitamin D (kind of like plants). Sunlight has also been found to decrease the risk for certain cancers, delay onset of eye issues like cataracts, lower blood pressure and may reduce the risk of type-2 diabetes. Vitamin D (even in the form of supplements in the winter) may also strengthen the immune system. Not to mention, vitamin D is necessary for the body to properly absorb calcium. This equates to strength and health of bones and teeth, meaning sunshine can help keep your bones strong and healthy. 2. Mood Enhancement: Anyone with a case of the winter blah’s can see the way sunshine improves mood. It makes us feel happier, more alert and ready to tackle life. Everyone seems more cheerful and full of hope. The first nice days in the spring, everyone wants to get out and bask in the warmth and promise of a sunny day. 3. Sleep: Anyone who has spent a long day outside knows that it can knock you out. 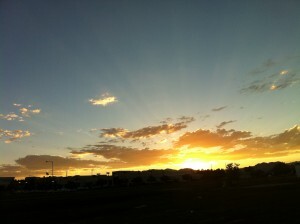 Call it sunshine or fresh air or whatever, but sleep comes easily after a day of outdoor work or lounging on the beach. The sun is tied to circadian rhythms (clearly), and these rhythms affect the normal process of night and day, sleep and wake, etc. Getting a bunch of sunshine actually stimulates the production of hormones (like melatonin) that affect your ability to fall asleep and stay asleep. So sunlight helps you sleep restfully. That’s a good thing for health in a ton of ways. 4. Exercise: So this isn’t as clear of a connection, but sunshine helps us be more active. Really, who wants to go out in 20 degrees and cloudy? No one. But 60 and sunny and everyone crawls out of their winter holes and embraces the sun. A nice day versus a crappy day can determine whether we get out and do something active, so the sun surely helps us be more active and thus, more healthy. Although being happier, more active, sleeping better and cutting risk of cancer and stroke is great, this is just scratching the surface. On an evolutionary level, the sun – and the fact that Earth is close enough, but not too close to it – is instrumental. We wouldn’t be here without it, so it makes sense that it has far more power and benefit than we can even understand. If it’s sunny where you live, get out and enjoy it. Eat your lunch outside, take a short walk, take the dog for a hike, take a family bike-ride, play with your kids at the park, start your garden or just sit on your patio with a glass of wine. Whatever it is, even if you just look up and acknowledge the sun as you’re walking from your car to work, just remember its there. Remember it matters and take a few moments to admire it’s awesomeness. Bonus points for lifting your gaze, closing your eyes and just taking it in. It’s impossible not to smile as you gaze up and feel the warmth. What do you like to do to get outside in the sunshine? Do you feel its benefits? Share your experiences in the comments. I’d love to hear from you and learn from you. At some point in life, we all find ourselves just chugging along. Following the routine and just going with it. We like this routine because it’s predictable, it’s safe and it’s comfortable. Routine gives the illusion of being in control. Routine is helpful in this crazy world and does help keep some of us sane, but what if there is a downside to this safe, comfortable pattern of events? What if we are sacrificing our own potential by taking the safe path? What if this routine is keeping you from truly being happy? Let that sink in for a minute, then think about the last time you did something scary or uncomfortable. It doesn’t have to be a big, life-changing thing, but when was the last time you stepped outside your comfort zone, did something out of character or took a risk? There is a book or process or whatever that challenges people to do something everyday that scares them. While this seems generic and maybe even a little strange, it has some serious merit. Doing something scary can change your life. Routine leads to autopilot and monotony. Doing something scary creates excitement, laughter and a new perspective. Changing your behavior and actions can change the way you feel or perceive something. Trying something new and scary has the potential to open up a whole new world of possibilities. Creating any change in life can be slightly uncomfortable. It’s learning to become ok with this discomfort and work through it that real insight, growth and change can happen. What is the saying: Insanity is doing the same thing over and over expecting a different result. The way to bust through this is to shake things up, bust through those patterns and see what’s possible. Learning to find comfort in discomfort can change the way you perceive life, the way you approach challenge, stress or change and the quality of your relationships. I am not afraid of discomfort (generally) and have made many big changes in my life, so I can speak to this topic on a personal level. The times I am most happy and spirited and enthusiastic is when I’m doing new, challenging things. 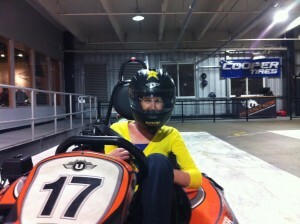 It’s exhilarating and frankly, kind of addicting. Not that you need a huge rush every time, but the feeling you get from being in that slightly uncomfortable zone is special. It’s easy to get into a rut in life, just working away, doing the things you should be doing and letting each day pass by uneventfully. Those days are so forgettable and aren’t really contributing to your growth and transformation. Some of the things that have made the biggest impact on my happiness and general feeling toward life were moving to Colorado, learning to mountain bike, teaching yoga, quitting my old job, starting freelance writing, participating in new activities around town and trying new things. These are the times when I laugh, I smile and not a worried thought or preoccupation exists – it’s like the time of true contentment, happiness and presence. One good example is mountain biking – it’s so hard. Physically it’s working through a lack of oxygen, fatigued muscles, and then climbing another hill and then having the technical skill to navigate rocks or roots. Most of the time on the bike is uncomfortable in one way or another. I always push through (often with lots of verbal support) and after the ride, I’m on top of the world. I exceeded my past abilities, maybe didn’t fall for once or made it up a big hill – these things push the bounds of what I think are possible and open up new possibilities. If I can do that hill, why can’t I do this bigger, scarier one? And if I can climb hills, maybe I can do this or that or another thing I’m afraid of. We never know just how strong, smart, confident, or whatever we are until we’ve been challenged. Routine leads us to not be present. Getting outside your comfort zone and doing scary things promote being present, being alert and feeling alive. When it’s put that way, what’s stopping you?